The collapse in UK productivity since the recession is extraordinary. Here is a chart from the OBR (pdf), showing how much lower potential output is estimated to be compared to estimates made just 6 years ago. According to the OBR, nearly 14% of output has been permanently lost, because underlying productivity has stopped growing over the last six years. This is unprecedented. As I have shown in earlier posts, UK GDP per capita has shown almost constant trend growth since the Second World War - until now. Not only is this ‘sudden stop’ in productivity unique in recent UK history, it is also a decline that is worse in the UK than almost anywhere else. In quantitative terms understanding why this has happened dominates everything else as far as the UK macroeconomy is concerned, including the impact of austerity (if the two are unrelated). It should be what is obsessing any UK Chancellor. Yet this is something George Osborne hardly talks about. In his budget speech the word ‘productivity’ does not appear even once. It is not hard to understand why the Chancellor keeps quiet about this productivity disaster. When growth was non-existent through 2011 and 2012, he liked to point to buoyant employment as an indicator of success, which of course is the obverse of the productivity puzzle. It would be embarrassing for him now to recognise how misleading this was. The Labour opposition’s main attack point concerns falling living standards, which is in large part a result of stagnant productivity, so he would much rather talk about something else. The fact that this Chancellor thinks this way is not surprising. To quote Tim Harford: “So let us applaud George Osborne for playing his own game well – a game in which economic logic is an irritation, the national interest is a distraction, and party politics is everything.” Yet it should be noted that this kind of attitude can only work in an environment where the government has substantial control over much of the media. I made fun of this here, but it is a serious abrogation of democracy. All this would matter less if actions revealed some coherent analysis and serious effort to deal with the problem. One widely held theory, championed by the recently appointed Deputy Governor of the Bank of England Ben Broadbent, is that the productivity collapse has something to do with what has happened to the UK’s major banks. This is certainly something LibDem Business Secretary Vince Cable worries about. Yet the government’s attempts to do something in this area, although welcome, have been modest, and these measures have had no noticeable impact on productivity. You would be forgiven for not knowing that the state currently owns a large part of the UK banking sector. Another possible explanation for the productivity puzzle is subdued investment, and the need for many productivity improvements to be embodied in the form of new capital. The budget did increase investment allowances, doubling the allowance introduced at the end of 2012. But the real question, which I asked back in 2012, is why all this was not done much earlier. It is respectable to believe such measures are ineffective or inefficient, but this budget indicates that is not the Chancellor’s view. So why not introduce these incentives when the recession was at its worst, rather than when growth is recovering? It is just another manifestation of the austerity U turn. George Osborne’s twin obsessions are winning the next election and reducing the size of the state. However perhaps he should also worry about his legacy. There are two possible verdicts that history will bestow. The first, and more optimistic, is that the OBR is wrong. There will be a long and vigorous recovery such that over the next decade the economy does recover the ground it has lost. The question economic historians will then ask is why the recession lasted so long, and George Osborne’s austerity will be up there as a major explanation. He will be remembered as the Chancellor who helped create the longest recession the UK has ever had. The second possibility is that the OBR is right, and this productivity has been lost forever. In that case historians will search in vain for his analysis of the problem, and mark him down as the Chancellor who presided over a disaster and pretended it was not happening.
" this kind of attitude can only work in an environment where the government has substantial control over much of the media"
A hugely well written article though, I really laughed at the last paragraph! lol! Tell us what you really think about Osborne, Simon, stop holding back. But seriously: is it safe to ignore Krugman/Eggertsson on the paradox of toil here? Those guys are Very Serious Keynesians who think that expanding AS at the ZLB is a bad idea. Maybe Osborne is right to hold back on the supply-side reform until we're off the ZLB? And, still, taking seriously the idea that, quote, "low productivity growth means that unemployment is lower"... I mean, I just don't know what to believe any more! Do you think Osborne now SHOULD be trying to raise productivity and, hence, raise unemployment now? That definitely sounds like the position of an anti-poor ideologue. Let's leave the Tory apologist ideologues like Paul Krugman out of this! Measures to raise real wages are just what orthodox modern Keynesianism tells us you want in a recession. Monetarists like Krugman may have their own ideas, but that's just partisan ideology. Productivity looks bad because there is little work to be done, but people daren't take the spare time off - they need to stay at their posts (doing nothing) to ensure that if there are cuts, they aren't included. Low productivity is not a cause of anything, it is just a symptom of scared workers during a downturn. BBC Radio Four's 'Profile' programme featured Rupert Harrison and is still available on the iplayer: "Ahead of the budget Mary Ann Sieghart profiles Rupert Harrison. He's the top economic adviser to George Osborne, and the man some call the 'real Chancellor' and 'the most important man you've never heard of'. Those who know him well and have seen his influence grow describe his career and characteristics." In the programme, ex-IFS Harrison is said to have written a paper putting forward expansionary austerity as a workable doctrine. "As far as I know, none of the people issuing dire warnings have actually tried to write down a model of what an attack would look like. And there is, I suspect, a reason: it’s quite hard to produce a model in which bond vigilantes have major negative effects on a country that retains a floating exchange rate. In a simple Mundell-Fleming model (M-F is basically IS-LM applied to the open economy), an attack by bond vigilantes has very different effects on a country with a fixed exchange rate (or a shared currency) versus a country with a floating exchange rate. In the latter case, in fact, loss of confidence is expansionary." Do you have a copy of that Harrison paper, or is the BBC wrong again in its description? Mary Ann Sieghart has it that Osborne has delegated the economics to this OE while Osborne can carry on being the part-time Chancellor of the Politics. So, in summary, you think that Osborne was right to increase the investment allowances (but he should have done it earlier). 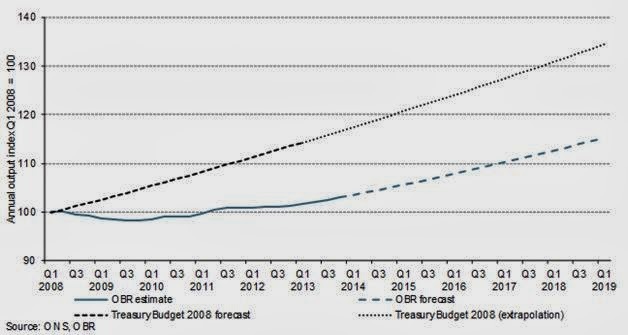 Just as (previous post) Osborne was right to put austerity on hold (but should have done it earlier). Without that, it doesn't seem to me to be very much to do with Osborne. The inferior post-crisis productivity in the UK is probably the mirror image of the superior UK productivity in pre-crisis years. In other words , the measurement is likely to be meaningless. High debt-fueled demand pre-crisis combined with busy workers - and the exact opposite situation post-crisis - probably explains the bulk of the "mystery". "The question economic historians will then ask is why the recession lasted so long..." no it won't. The recovery from balance-sheet recessions is always slow. Britain had the mother of all such. Austerity or the lack of it has very little to do with it either way. Yet again the almost the entire academic economics (rather more than 1981...) profession is wrong. Simon, what's your view on labour hoarding? By how much would unemployment have had to rise to keep output per worker in line with the previous trend? "There are two possible verdicts that history will bestow. The first, and more optimistic, is that the OBR is wrong. There will be a long and vigorous recovery such that over the next decade the economy does recover the ground it has lost. The question economic historians will then ask is why the recession lasted so long, and George Osborne’s austerity will be up there as a major explanation. He will be remembered as the Chancellor who helped create the longest recession the UK has ever had. The second possibility is that the OBR is right, and this productivity has been lost forever. In that case historians will search in vain for his analysis of the problem, and mark him down as the Chancellor who presided over a disaster and pretended it was not happening." I can think of a third verdict, one based on common sense. Regardless of the future course of the British economy, people will look back on this period and realize that negative aggregate supply (AS) shocks have almost nothing to do with fiscal policy stance. Not only is there no correlation at all between fiscal policy stance and productivity (the adjusted R-squared value is 0.7%), the UK's increase in CAPB between 2007 and 2013 was only slightly above the OECD average of (-0.5%) of potential GDP. Evidently when the only economic tool you have is a fiscal stimulus hammer, every single economic problem looks like a nail. And taking care to exclude the real estate sector (SIC 2007 Section I) because output of this sector includes the imputed rent of owner-occupiers, which requires no labour input (the IFS did the same) what you’ll find is the following. Labour productivity fell 5.6% from 2008Q1 to 2013Q3 using ONS data. Of the 15 sectors considered by the IFS, labor productivity has fallen in 12 which accounted for 84.7% of non-real estate gross value added in 2008Q1. The only sectors where productivity increased are: 1) administrative and support service activities, 2) arts, entertainment, recreation and other services, and 3) information and communication. Within the 12 sectors in which labour productivity declined, labour productivity declined by 7.9%. The decline weighted by the size of the 12 sectors relative to the whole economy in 2008Q1 yields a value of 6.6 points. Doing the same thing for financial and insurance activities, and mining and quarrying, yields a value of 2.2 points and 1.4 points respectively. Thus within the portion of the economy experiencing declining productivity, finance and insurance contributed about a third of the decline by weight, and mining and quarrying about a fifth, with nearly half of the decline caused by the ten other declining sectors. In short, declining productivity is a very widespread problem in the UK involving 80% of the sectors contributing 85% of output. What place do applied middlebrow models have?